Michael Cooper was selected with the 60th overall pick by the Lakers in the 1978 NBA draft. He turned out to be one of the biggest steals in NBA history by developing into a defensive ace for the Showtime Lakers. 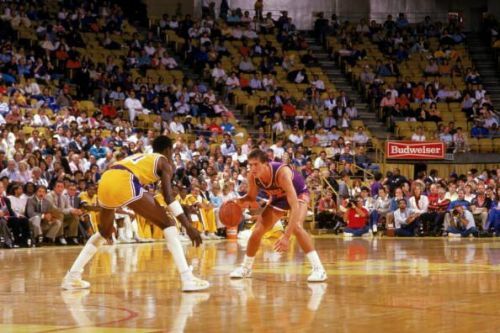 While Cooper could play at the point guard position, he generally guarded the best perimeter player on his opponents' teams. Cooper generally came off the bench during the Showtime years, but played as part of the Lakers' clutch time lineups. Cooper became the prototype for the modern 3-and-D player in the middle of a glittering career littered with 5 NBA championships through the '80s. In his best season, Cooper won the Defensive Player of the Year award while averaging 10.5 points on 38.5% shooting from 3-point territory, in addition to 4.5 assists and 1 steal per game. Cooper has, since retirement, become the only player to win titles in the NBA, WNBA and the D-League as a coach or player.